Role the poster board into a tight tube, and put it inside of the cardboard toilet paper roll. Let go of it and let it expand. Staple the top and bottom of the poster board roll to ensure that it retains this size. 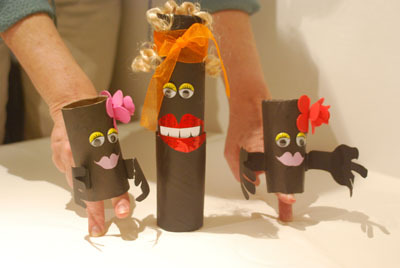 With the poster board roll inside of the cardboard toilet paper roll, construct a puppet face. The upper lips should be on the poster board roll and the bottom lips on the cardboard toilet paper roll. Make the upper part of the mouth continue along the length of the poster board roll. Decorate the rest of the puppet's face. You can add arms and clothes on the cardboard toilet paper roll. Put the poster board roll into the cardboard toilet paper roll. Align the top of the mouth with the bottom of the mouth. 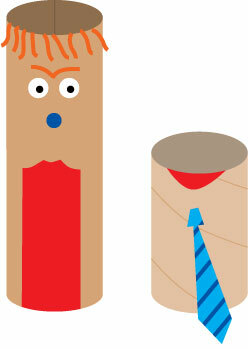 To operate the puppet, move the poster board roll up and down causing the puppet to open and close its mouth.